Getting a georeferenced topo profile is a bit of a pain. It should be easy to do it simply in Arc but it’s not. The point projection is less of a pain, although it still requires a bit of work. If anyone else knows a quicker way to do this, I’d love to know, so share away! I am doing this in ArcGIS 10; this also requires XToolsPro, which does nominally cost money although without paying the program still works after the trial period, and I think works for most recent versions of Arc. 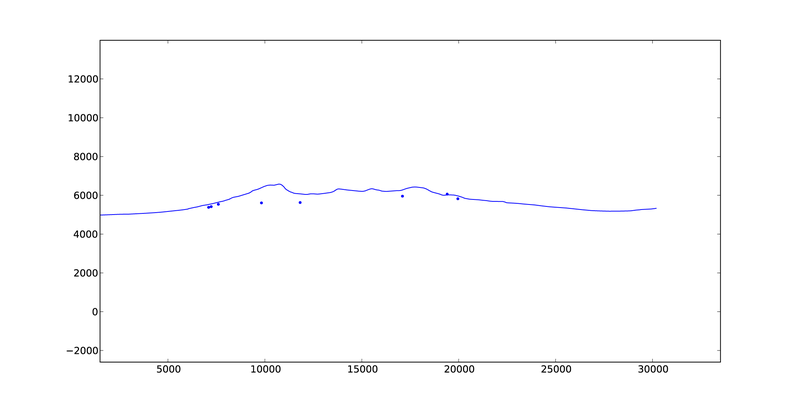 I am also using Python (with matplotlib) to do the plotting. It could be done in MATLAB very easily, for those with a copy. Edit the line in ArcMap and draw the line. It’d probably be helpful to have the DEM loaded. It seems reasonable to use the same cell size as your DEM but you probably don’t have to. Make sure you input the line raster, not the DEM. I like to add both UTM and Lon/Lat (WGS84) coordinates to my attribute table. This requires doing the operation twice, which is trivial. In any case, you need some sort of projected coordinate system so that you can plot the profile with meters on both axes, so UTM is good. Open up the .dbf file (basically the attribute table) of the point shapefile in your favorite spreadsheet program, and find the distance from the start for each point using the Pythagorean theorem. To be safe, save this file as a new spreadsheet file instead of saving the .dbf. To plot it with the code I will show below, export the file as a .csv and delete the header row, so that it is only columns of numbers. This assumes you have a spreadsheet that has all of your samples with some sort of X,Y,Z coordinates. If you only have X and Y, you can get Z with the values to points step outlined in Step 4 after you have made a shapefile out of the spreadsheet. Right click on the sample file in the Table of Contents in ArcMap, and go to Data –> Export Data and make a shapefile out of it. Same as Step 4 above. This is basically finding the along-section distance of the points. It assumes that the points will project to the nearest point of the profile, not along strike (if your section line is not strike-normal). First, find the best-fit line of the UTM Easting and Northing coordinates from your section line. I did this by plotting them in Excel and fitting a trendline. This line will have the form y = mx+b. Then, open the .dbf file from your sample shapefile in Excel. Then, calculate the distance along the projection for that point using the Pythagorean theorem as in Step 6 above. Finally, export the file as a .csv and delete the header row, if you have one. This entry was posted in GIS, Himalaya/Tibet, structure/tectonics. Bookmark the permalink.